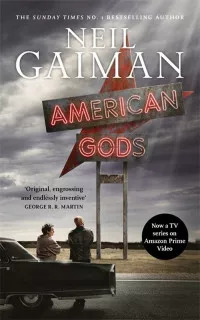 American Gods, the extraordinary, highly acclaimed epic novel from storytelling genius and international bestseller Neil Gaiman, comes vividly to life in a major new TV series on Amazon Prime Video starring Ricky Whittle, Ian McShane, Emily Browning and Gillian Anderson. If you are to survive, you must believe. Shadow Moon has served his time. But hours before his release from prison, his beloved wife is killed in a freak accident. Dazed, he boards a plane home where he meets the enigmatic Mr Wednesday, who professes both to know Shadow and to be king of America. Together they embark on a profoundly strange road trip across the USA, encountering a kaleidoscopic cast of characters along the way. Yet all around them a storm threatens to break. The war has already begun, an epic struggle for the very soul of America, and Shadow is standing squarely in its path.